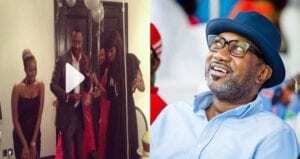 Nigerian billionaire businessman, Femi Otedola is clearly having a great time with his family members this Saturday as he just shared a video of himself and his lovely girls dancing. He was so excited, he even tagged the singer in the post. The video shows Otedola and his three daughters, DJ Cuppy, Temi and Olawunmi, along with his wife, Nana, rocking to the beat of the song. Getting down with my girls! Cc: @davidoofficial ? ?… FOte?